bringing your back arm around and in front of you toward your Nose for the direction. would initiate a frontside spin by turning counterclockwise. Creating spin momentum comes from combining a series of body movements at the right time. and into your hips and legs as you extend into your bounce. is the key to getting a proper initiation. looking just above your shoulder in the frontside direction. will help your body stay upright. If your head and upper body are in an upright position, you'll create a stable flat rotation. This will engage your core muscles in the air and reconnect your upper and lower body. as you engage your core and your body spins 180 degrees. At this point in the rotation you will see the trampoline in the opposite direction you are facing on initiation. The landing on a Frontside 360 is what we refer to as a blind landing. as your body follows through with a spin completing the 360. Your line of sight is the key to landing a full rotation. your body will be unable to rotate past 180 degrees. it can put you off balance in the air. Get used to the feeling of spotting the trampoline behind you at a 180 degrees. You will be stomping Frontside 360s in no time. 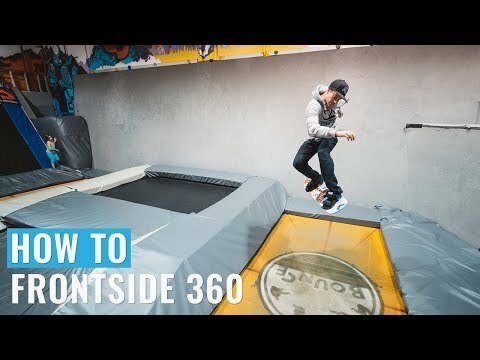 This tutorial is filmed at Whistler Bounce. Our goal is to improve your riding.